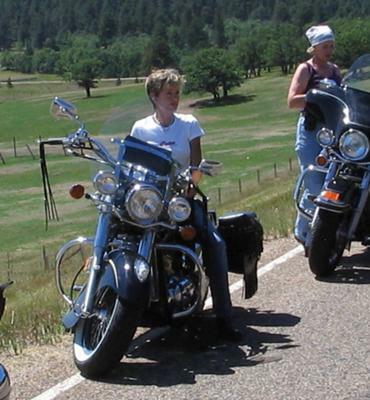 I had been riding with my husband since I was 18. One day I noticed how many young women were on their own bikes. So at the ripe old age of 58 I thought why don't I give this a shot. I took the class and surprised myself by passing. I started with a Honda Rebel and put about 200 miles on it. I then moved up to my 02 Kawasaki Drifter. I just love that bike. It just goes to show you that you can teach an old dog new tricks! I'm so glad to see so many people on 2 wheels, doesn't matter what Mmke, just as long as your having fun and being safe. I have 2 bikes a Moto Guzzi Cafe and a Kawasaki Ninja, I love them both. I've been kicking around learning to ride for the last year and kept telling myself that 54 was too old to learning something like this and be safe. You've blown that idea out of the water for me...I can't use that excuse any more. I need to get serious about it I guess. I did it at 58 too! An awesome accomplishment, right? Love your bike! I'm damn near fifty and registered to take the class and get my first bike by spring. I can't wait to take on the open road. It's never to late to follow your passion. Wow, that is SO inspiring! I want to be like you when I grow up. ;) Just plain awesome! ...and she looks GOOD on her own ride! Great accomplishment - congrats on being December 2010! Awesome picture. You are never too old to do the things you love. That is what keeps us young anyways.